Lightly scald shiitake mushrooms in hot water. Remove, drain and cut into slices. Combine chicken meat, mushrooms and crabsticks in a mixing bowl. Add ingredients (A) and toss lightly before marinating for 4-5 minutes. 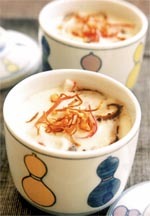 Arrange a little of each marinated ingredients into the chawanmushi cups and set aside. Beat the eggs and mix with all the other sauce stock ingredients. Strain the mixture through a fine wire mesh ladle. Fill up the chawanmushi cups with the custard mixture. Carefully skim off any bubbles on the top of the mixture. Place cups in a steamer. Cover the chawanmushi cups with microwave plastic wrap. Steam over gently boiling water for about 20 minutes or until the custard sets. Serve hot with a sprinkling of garlic crisps. Makes four cups.